It Starts with the Hog: Duroc hogs, typically dark red in color, maintain moisture well and has good fat marbling throughout -- all highly desirable qualities in cuts of pork. Duroc pigs also possess a significant amount of lean muscle. Hog farmers favor Duroc pigs because the breed consistently yields plenty of high quality meat. Berkshire pork comes from a heritage breed pig. With a long history that goes back some 300 years in England, this black-and-white pig is highly regarded for juicy, tender, and flavorful pork which is heavily marbled with fat. Known as Kurobuta pork in Japan, Berkshire is to pork what wagyu is to beef. We hand pick each pork belly we cure. The Reason we Dry-Cure: Dry-curing involves the rubbing of food with a mixture that is used to preserve foods. The curing compound typically includes salt, sugar, sodium nitrite and seasonings that are rubbed on the surface of the meat. But mass-produced bacon is made in a different way – cured by injections of salty water, which can also include chemicals such as potassium nitrate, sodium nitrate and ascorbic acid. “The main reason that’s done is to actually increase the weight, so when you’re buying bacon in the supermarket you’re actually buying expensive water,” says Charlie Pyper, the founder of Cure & Simple, a premium bacon supplier. Seasoned with Real Spices: We use real spices during and after the curing process. Black Pepper, Raw Honey, Nutmeg and Cayenne Pepper are just some of the ingredients found in our bacon. Hickory and Apple Wood Smoked: We smoke all of our bacon. 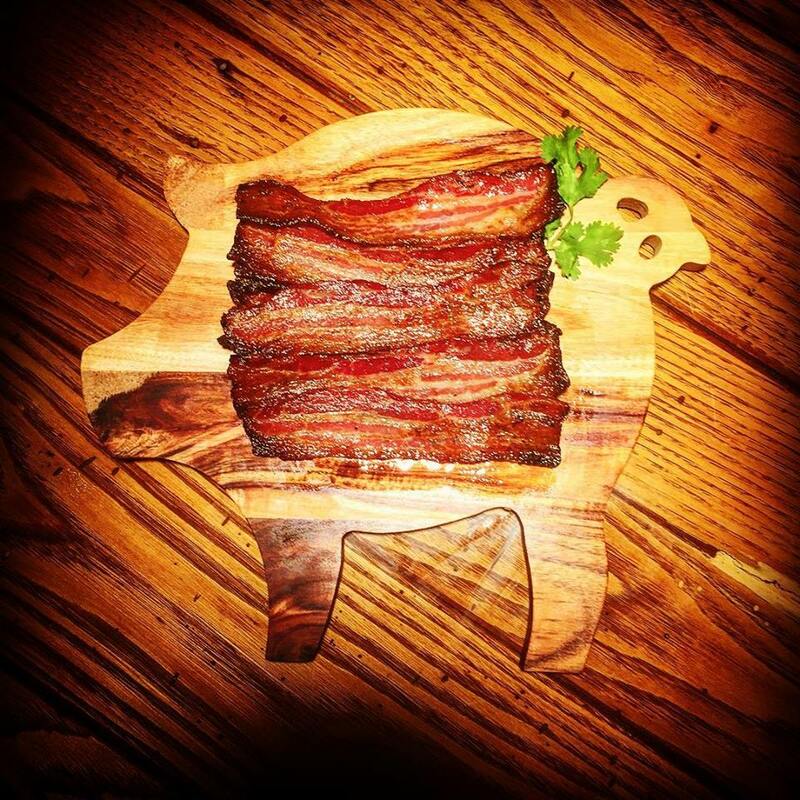 We smoke our bacon at low temperatures using hickory and apple woods. After the smoking process, the bacon will sit in a refrigerated state to allow the flavors from the woods to make their way into the bacon. We do not add "smoke flavor" to our bacon. Our mission is to make the best bacon in the world. We hope you enjoy our bacon.